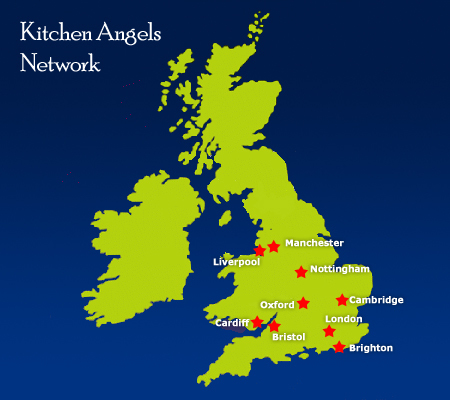 Kitchen Angels support the community by taking lead in hosting different charity events. This means each time you avail of our catering services, you not only get a creatively designed party but also keep our charity activities going for the less fortunate. Got a special occassion in mind? Book your reservations now with one of London's best catering company and we will be happy to assist you. Call us at 08456 447769 so we can discuss your special occasion immediately. "Kitchen Angels run a very professional service. Being the organiser of an event you have a lot to consider and Kitchen Angels took one less stress away. They arrived promptly, offered an extensive menu for our event participants which took them from breakfast to lunch and their food was enjoyed by everyone. The chef and staff were very helpful and friendly and they made sure that the day was hassle free. I would definitely use Kitchen Angels again for our other events!" "A huge thank you for coming to provide delicious food at this special event!We hope that you enjoyed the day and had lots of customers too! Thank you so much for your donation. This is so gratefully received, we are now heading towards £3,000.00 which would mean we can give £1,000.00 each to Sail 4 Cancer, Living Paintings and St. Mary's Keystone Project." "I just want to say on behalf of all those who organised and attended the above event in January this year a huge thank you for all your help and assistance, both in the planning and the event itself. We still have guests who cannot stop talking about your wonderful canapé s and how tasty they were! The service from the team was exemplary and the professional standards shown were very high indeed. On a personal note from the team organising the event, thank you so much for your kind words and generosity in making this event so successful. It is no mean feat to put on such an event with only two months notice and your help was invaluable at all times. We managed to raise a fantastic sum of £1771.81, all of which goes direct to the NAT Support Appeal which will be used to assist members of staff in difficult times. We hope to plan a yearly function and to increase the size of the event and also the funds raised. Thank you for making this possible." "We are writing to thank you for so generously supporting our fundraising event held at Bagshot Cricket Club on Friday, 3rd July. You will be pleased to know that the event raised around £12,000 for the two nominated charities. We simply would not have been able to raise this money without the help of sponsors like you who so kindly helped us. We are sure that you would agree that the event was a huge success and a lot of fun for everyone involved.Thank you once again for your support and we hope to organize a similar event next year and it would be great to see you there. " A Chef who cooks a free Christmas dinner for local pensioners every year has said that 2008 will be his last. Executive Chef of Thatcham-based Kitchen Angels Catering Company, Hassen Guerroudj, thanked all the volunteers that have helped him in his endeavours to provide a free meal for pensioners and lonely people during the holiday season. In addition to pensioners lunch, Mr. Guerroudj has been providing Christmas Day dinner at various venues, with the help of donations from local food suppliers. He said, It was heartwarming to make these people's Christmas as special as those celebrating with their own families in their own homes. In what has now become a tradition, Kitchen Angels provided a feast for older Thatcham and Newbury residents who may not have otherwise had a Christmas dinner. Led by executive chef Hassen Guerroudj, with the help of local volunteers, they supplied food, staff and tableware to the events which were hosted at the Kings Head Thatcham, and St George's Hall Wash Common.